Fun Fairy Cake For A First Birthday! 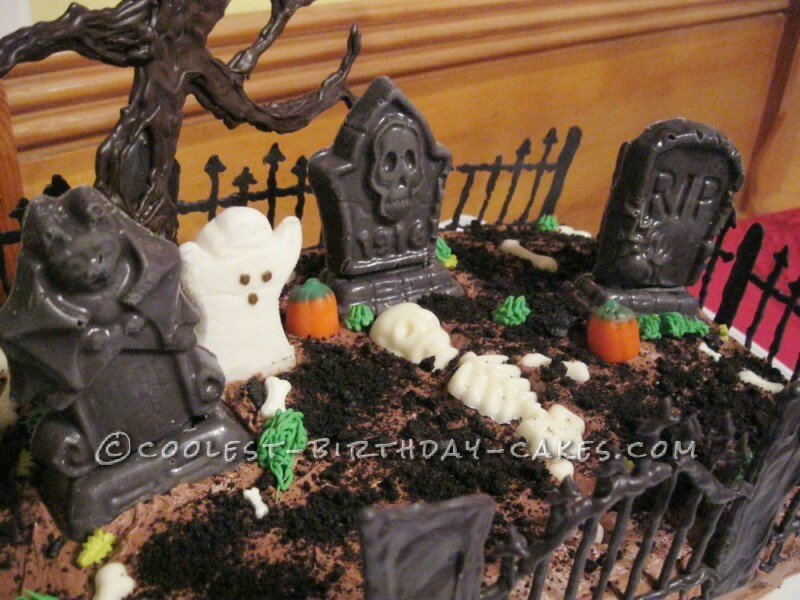 I’ve made graveyard cakes in the past but they never came out how I wanted them to look. 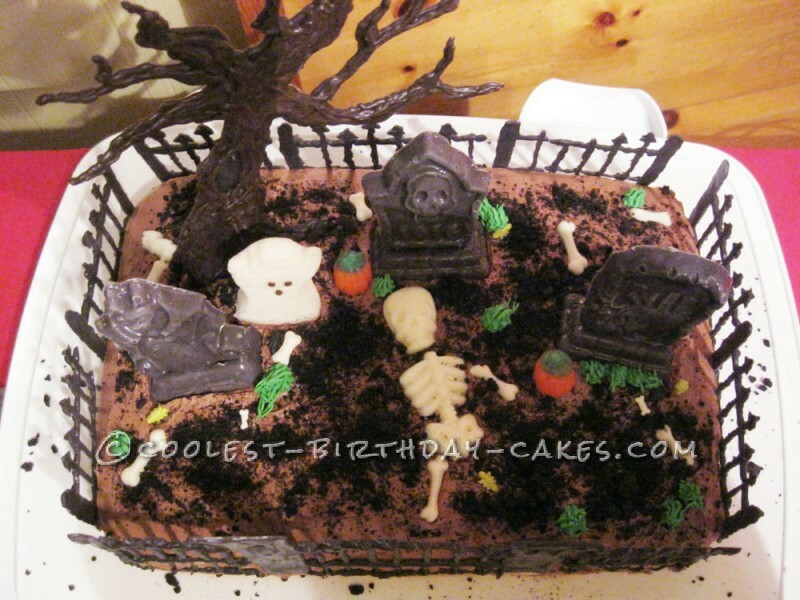 So, I tried again with my Spooky Graveyard Cake and was very happy with it this time. 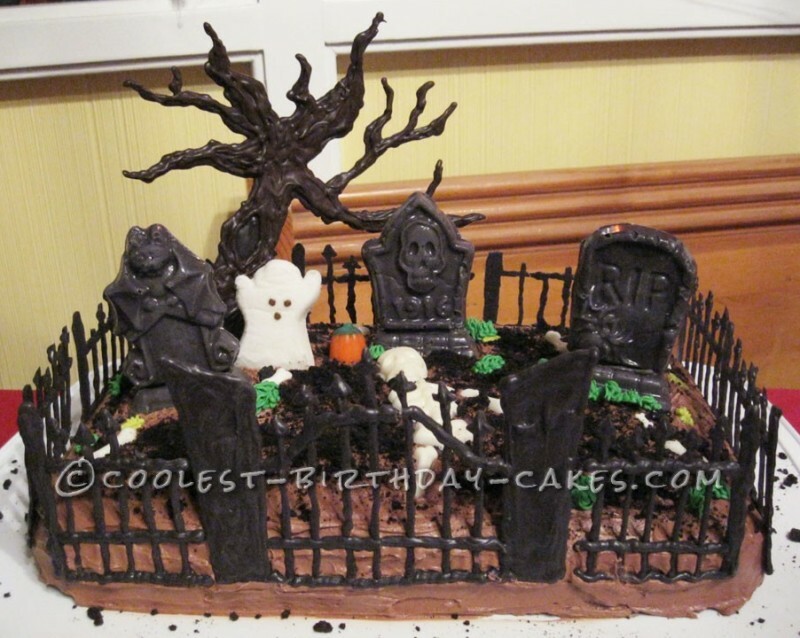 First, I gathered up a bunch of candies and treats for decorating the ground of the graveyard (Peep Ghosts, candy pumpkins, candy bugs, candy melts and a few candy molds, and some crushed Oreos). I made a chocolate cake in a regular 9″ x 13″ cake pan and let it cool completely before I frosted it. While I waited for it to cool, I started to make some fence drawings that I would later trace with candy melts. Once I figured out how long I wanted each fence to be and the style I wanted the fence to look, I covered the drawing with wax paper, and drew the drawing out in black candy melts. I wanted the fence to look like an old wrought iron fence from a creepy old cemetery. So that it wouldn’t break when I lifted it off the wax paper, I drew the fence in about 5 inch segments and pieced it back together when I attached it to the cake. I also made the craggily tree by tracing on wax paper over a drawing I did with candy melts. To keep the tree from falling over, I braced it in the back with a rectangle of candy melts I drew on the wax paper as well. Once the cake was cooled and frosted, I attached the fence by pressing the pieces into the sides of the cake. Next, I decorated the grounds. I found some cute gravestone candy molds and filled them with melted black candy melts, and did the same with a skeleton candy mold in white candy melts. Using the chocolate cookies of an Oreo sans filling, I sprinkled crushed chocolate cookies all over the top of the cake. If you want it to look like someone was freshly buried, pile up the cookies in front of a gravestone. For a little grass, I piped some green frosting with a # 233 Wilton frosting tip. The frosting comes out like little grass blades or hairs and looks really good. The tree was a bit heavy from all the candy melts I’d used, so I propped it up with the rectangle of candy I made earlier and shoved the tree down into the cake a bit to make sure it was steady. Candies of pumpkins, ghosts, bugs and bones were the last to go on. I thought the Peep Ghost was so cute, I wanted him to be jumping out from behind a gravestone. Peek-a-Boo! I think my favorite part of the cake is the fence. I wanted an edible fence that also looked kind of spooky, and I think this technique worked pretty well for my purposes. My friends liked my cake so much they didn’t want to cut into it! I had to take the first piece to get anyone else to take a slice.